What better way to kick off summer than with a NEW apron?! Abby over at the Feathered Nest had so much fun with the last swap and still receives emails from ladies who want to join the next swap, so get ready for another one! Tell all of your friends - the more the better!!! Your name does me no good if she doesn't have your address! 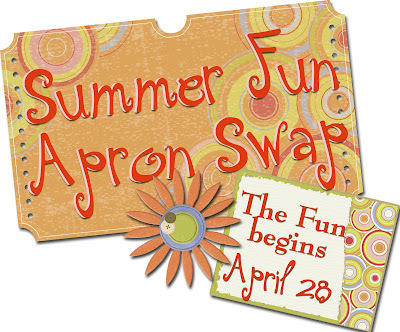 SWAP WILL BE CLOSED ON MAY 5TH! Include a fun story or information about yourself and anything else you want like a recipe, cookbook, etc. 3.) BE CREATIVE! The rest is up to you - use your imagination! 4.) Aprons MUST be in the mail no later than June 9th. That gives everybody 4 weeks to sew. Contact Abby if you have any further questions, happy swapping!